Blogging Marathon# 49: Week 4/ Day 1 Theme: Bookmarked Recipes Dish: Black & Wild Rice Salad with Roasted Butternut Squash My theme for the final week of this month's marathon is 'Bookmarked Recipes'. Like all of you, I have a ton of bookmarked recipes and find every opportunity to try those out. So when we have it as a theme in Blogging marathon, I make sure I make the most out of it. Preheat oven to 450°F. Toss butternut squash with 2tbsp olive oil and season with salt & pepper. Spread on a baking sheet and roast, tossing once, until golden brown and tender, 20~25 minutes. Let cool. In the meantime, cook black rice and wide rice in a large saucepan of boiling water until tender, 35~40 minutes. Drain and rinse, shaking off as much water as possible. Let cool. Alternately, both the rice can be cooked separately. 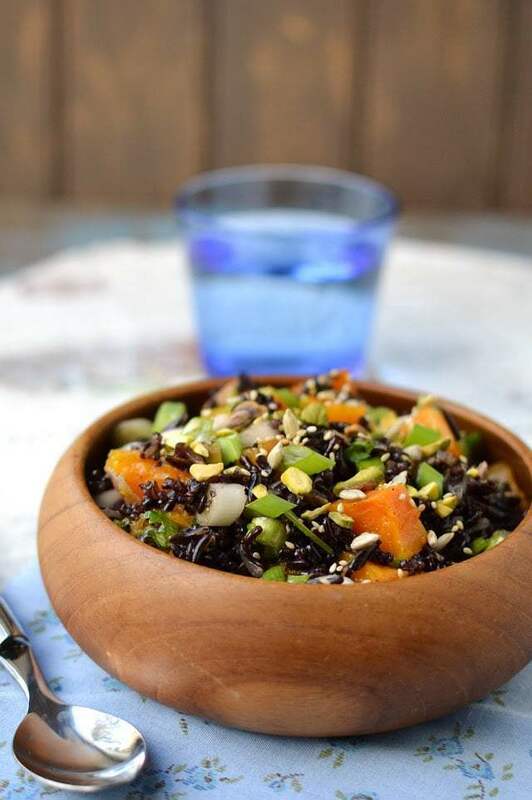 Cook black rice with 1 cup of water (rice:water=1:2)for 40~45 minutes, until all the water is absorbed and rice is tender. For wild rice, combine 1 cup of water and wild rice (rice:water=1:4) in a sauce pan, bring to a boil; lower the heat and simmer till all the water is absorbed and rice is tender, about 40 minutes. Once the rice & butternut squash are ready, combine them in a mixing bowl along with scallions. In a small bowl, whisk all the dressing ingredients and pour it over the rice mixture. Sprinkle the nuts and seeds and enjoy! !